CREATIVE’s Magazine of Promotion & Marketing includes TFI Envision | TFI Envision, Inc.
New York, NY — CREATIVE Magazine is targeted to sales promotion and marketing executives who manage Point-of-Purchase Display, Trade Show Exhibit and Sales Promotion Programs. Two projects designed by TFI Envision, Inc. were selected for inclusion in their September 2018 magazine. NAPA® NightVision™ In-Store Prepacked Endcap Display was included in “Corrugated Displays, 2018”. This section showed a wide variety of corrugated displays including stock displays, single faced corrugated, self-shippers, pallet displays, mass merchandisers, power wings, etc. It was shown in full color and highlighted the importance of corrugated displays as a promotional tool. 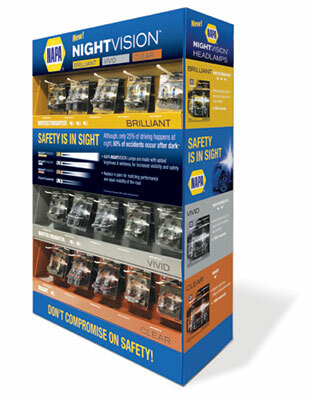 TFI Envision developed the “Safety is in Sight” theme, the structure and the graphics for the NAPA® NightVision™ In-Store Prepacked Endcap Display to mirror the brand look and feel of the NAPA® NightVision™ packaging (also created by TFI Envision). It was designed to maximize each side of the display unit as an educational/informational sales tool, making it easy to shop for the bulb needed. The endcap also explains why it is important and safer to replace your headlights in pairs. 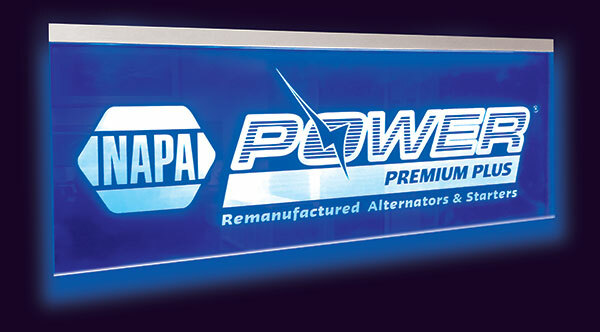 NAPA® Power Premium Plus® Promotional Signage was included in the “Signs and Display Graphics, 2018” section which focused on the role of signs and display graphics in the retail store and showed the latest developments in P.O.P. signage, banners and graphics. TFI Envision, Inc. developed the concept and executed the program for NAPA® Power Premium Plus® “Unbox The Power” promotion. The project objective was to deliver a promotion that drives retailers to sell more NAPA® Power Premium Plus® starters and alternators. Successful participants in the promotion were awarded this custom etched, edge lit signage, designed by TFI Envision for use in the participant’s automotive aftermarket retail store.